Summary: A new mathematical model may help to explain why we are not yet able to create a robot that can jump like a flea, but proposes a way we might get closer to achieving better nature inspired robots. When it comes to things that are ultrafast and lightweight, robots can’t hold a candle to the fastest-jumping insects and other small-but-powerful creatures. In a study published April 27 in the journal Science, researchers describe a new mathematical model that could help explain how these and other tiny organisms generate their powerful strikes, chomps, jumps and punches. 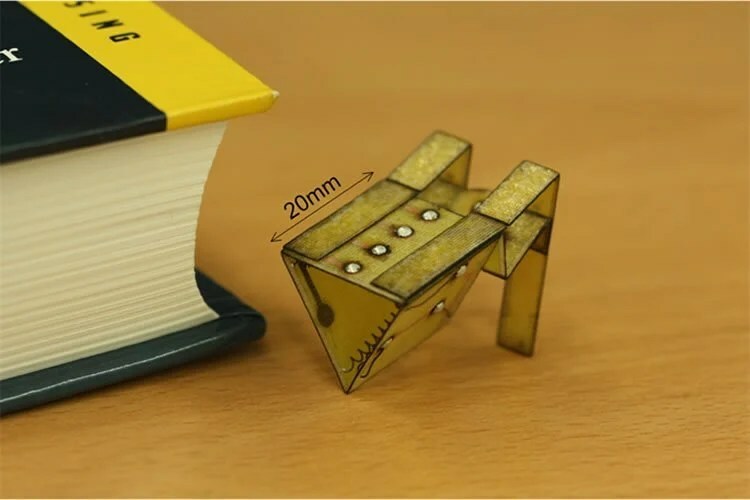 The model could also suggest ways to design small, nature-inspired robots that come closer to their biological counterparts in terms of power or speed. Tough yet flexible tendons, cuticles and other elastic structures stretch and release like slingshots, powering their jumps and snaps. While traditional mathematical models of performance take into account the inherent physical tradeoffs of muscle — which can contract forcefully, or quickly, but not both — they fail to factor in the tradeoffs inherent to springs and latch-like mechanisms as well. In other words, nothing can be faster, stronger, and more powerful at the same time. “Until now these other components have been mostly black-boxed,” Patek said. A mini robot inspired by the anatomy and jumping mechanism of a flea. NeuroscienceNews.com image is credited to K.Cho. First, they compiled data on the size and top speeds and accelerations for 104 species of elite plant and animal athletes. They compared the data to similar measurements for miniature robots inspired by ultrafast movements such as unfurling chameleon tongues, snapping Venus fly traps and hopping insects. By incorporating the performance tradeoffs of biological and synthetic springs and latches, the researchers hope to better understand how variables such as spring mass, stiffness, material composition and latch geometry work together with muscles or motors to influence power. The model allows researchers to input a set of spring, latch and muscle or motor parameters and get back details about an individual’s theoretical maximum speed, acceleration, and other aspects of performance at a given weight. But the model gives researchers a tool to design small, fast-moving robots with more precisely matched components that work better together to enhance performance, said Sarah Bergbreiter, an associate professor of mechanical engineering at the University of Maryland who makes jumping robots the size of an ant. Funding: This research was supported by the U.S. Army Research Laboratory and the U.S. Army Research Office (W911NF-15-1- 0358), the Royal Society of London (UF130507), the U.S. National Science Foundation (IOS-1439850) and the John Simon Guggenheim Foundation. Video Source: Video credited to Boehringer Ingelheim AH. Original Research: Abstract for “The Principles of Cascading Power Limits in Small, Fast Biological and Engineered Systems” by Mark Ilton, M. Saad Bhamla, Xiaotian Ma, Suzanne M. Cox, Leah L. Fitchett, Yongjin Kim, Je-sung Koh, Deepak Krishnamurthy, Chi-Yun Kuo, Fatma Zeynep Temel, Alfred J. Crosby, Manu Prakash, Gregory P. Sutton, Robert J. Wood, Emanuel Azizi, Sarah Bergbreiter and Sheila Patek in Science. Published April 28 2018. Duke University “Why a Robot Can’t Yet Outjump a Flea.” NeuroscienceNews. NeuroscienceNews, 27 April 2018. Duke University “Why a Robot Can’t Yet Outjump a Flea.” http://neurosciencenews.com/robot-flea-jump-8905/ (accessed April 27, 2018). Mechanical power limitations emerge from the physical trade-off between force and velocity. Many biological systems incorporate power-enhancing mechanisms enabling extraordinary accelerations at small sizes. We establish how power enhancement emerges through the dynamic coupling of motors, springs, and latches and reveal how each displays its own force-velocity behavior. We mathematically demonstrate a tunable performance space for spring-actuated movement that is applicable to biological and synthetic systems. Incorporating nonideal spring behavior and parameterizing latch dynamics allows the identification of critical transitions in mass and trade-offs in spring scaling, both of which offer explanations for long-observed scaling patterns in biological systems. This analysis defines the cascading challenges of power enhancement, explores their emergent effects in biological and engineered systems, and charts a pathway for higher-level analysis and synthesis of power-amplified systems.